According to an Experian survey conducted in 2013, Guildford is the luxury shopping capital of the UK, and a stroll along the High Street soon leaves you feeling that they might be right. Even away from the high fashion and specialist jewellers of the High Street the town continues to surprise the visiting shopper though the sheer variety of its retail outlets. There are specialist camera shops, antique dealers and art supplies, book shops, art galleries and candle retailers, cafes, restaurants, food halls and farmer’s markets, and no less than four separate enclosed shopping centres, each with its own distinct atmosphere. Whilst originally an American tradition, ‘Black Friday’ sales have become increasingly popular each year with UK shoppers spending £810 million online during the 2014 Black Friday sales. Black Friday kickstarts the Christmas shopping season with shops across the nation trying to out-do each other in terms of the discounts and deals they offer. Argos – In recent years, Argos has participated in Black Friday with great discounts on top electrical items, such as Apple iPads, Apple iPhones, Xbox 360, Dyson vacuums, Tom Tom satellite navigation systems, as well as heavily discounted televisions. They also had an array of deals and savings on popular children’s toys. Boots – Black Friday at Boots is a great way of getting a lot of Christmas gifts checked off for family and friends, as last year they had great discounts on items, such as cologne, nail sets, electric toothbrushes, hair straighteners, and even electrical items, such as bluetooth speakers. Curry’s / PC World – In 2014, Curry’s & PC World had some great Black Friday offers, including heavily discounted Dr. Beats headphones, Samsung Galaxy tablets, and even 50% off a Samsung Smart TV. They are sure to have some amazing discounts in the 2015 sales! Marks & Spencer – Marks & Spencer is also likely to have some great sales over Black Friday weekend with much of their stock heavily discounted. In 2014, we saw over 30% marked off on fashion, foot ware, and even perfume. A great place to pick up a nice outfit for Christmas and save a few pennies all at the same time. Sainsbury’s – Despite not offering any of the same deals on their website last year, Sainsbury’s participated in the Black Friday shopping day with amazing deals on televisions, offering discounts as high as 50%. They offered a “when it’s gone, it’s gone” policy. Tesco – Gaming consoles, televisions, iPad tablets, sound bars, coffee machines, and microwaves were just some of the items discounted at Tesco in the 2014 sales. For Tesco, Black Friday is the busiest shopping day of the year, even beating out the Boxing Day sales. The store offers deals both in store and online. Online – Many of the deals are also available on the Internet from the same stores listed above, although the best offers tend to sell out very quickly and store websites often crash on the day due to demand. You can find a list of online sales on the Black Friday Deals UK website. Many of the historic shop-fronts along Guildford’s famous cobbled High Street boast window displays of gold, silver and designer jewellery, expensive handbags and the latest fashions. Interspersed at intervals there are larger stores including Jaeger, M&S, Jo Malone, Monsoon and House of Fraser. There are, perhaps, a greater proportion of the smaller and older establishments along the northern (or left as you look up the hill) side of the Street, whilst the southern side tends toward more modern buildings including a Sainsbury’s Foodhall, and the entrance to the Tunsgate Square Shopping Centre. The endless retail opportunities along the High Street are diverse and great in number, and when Experian dubbed Guildford as the luxury shopping centre of the UK, the High Street must have been high on their list of qualifying locations. 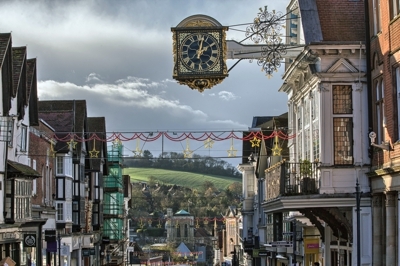 With the historic gold clock as the focal point and the rolling hills in the background, the High Street maintains its position as the heart of the town. In addition to famous brands and boutique shops, on the first Tuesday of every month a Farmer’s Market is set up in the High Street. This gives the area a bustling and intimate atmosphere as stalls sell beautiful craft items, home cured meats, conserves and art works. 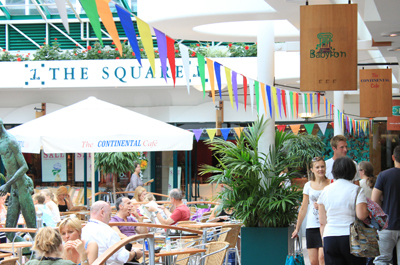 The Friary is Guildford’s largest undercover shopping area, with over fifty stores spread out across three floors. The shopping centre has a direct covered link to the adjacent Bedford Road multi-storey car park, enabling visitors to enter the centre on the second floor. In addition to the brightly lit and modern shops, the centre has invested in facilities to make shopping easier and less stressful for parents and children. There are ‘kiddy cars’ available, free of charge, from the Concierge, a soft play area for younger children, and the baby changing facilities include private cubicles, a microwave and bottle warmers. If your offspring fall into the ‘budding escape artist’ category, you can even obtain free wristbands from the Concierge on level 1. Write your contact number on the band and if your child makes a break for it, staff can contact you and ensure that you and your child are re-united. In the spirit of inclusiveness the Centre also assists those with mobility difficulties through the Shop Mobility store on level 3 of the Bedford Road car park. There you can hire wheelchairs or scooters, with reserved parking right next to the store. Wheelchair friendly access to the Centre is, of course, provided. 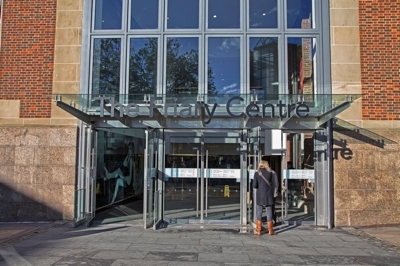 In terms of the shopping options, the Friary Centre delivers what you’d expect from a large and modern development. There are fashion outlets including River Island, Hollister and Ann Summers, mobile phone retailers, home furnishings, accessories, three cafes, twelve food and drink outlets (including Costa, McDonalds and Cafe Moka), a dozen footwear retailers, health and beauty stores (including Holland & Barrett), and a mixed range of ‘market stall’ outlets offering everything from eyebrow threading to satellite TV and woolly hats. The walkways feature comfortable seats for weary shoppers, and the escalators make movement between floors an easy option, this being particularly advantageous since the food court and many of the refreshment outlets are on the third level. Standard opening times at the Friary tend to be Monday through Saturday 9am to 6pm with Thursdays having extended hours until 8pm. The centre is also open 11am to 5pm on Sundays and bank holiday weekends. Some shops, however, may vary slightly in their opening hours. The Ladymead Retail Park is located on the A25 Woodbridge Road to north of the town centre, and close to the A3 corridor to London. 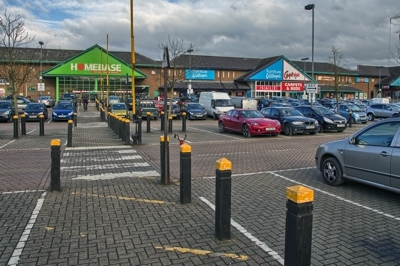 Like most ‘edge of town’ shopping centres, Ladymead is home to large retail units with ample free parking right next to the stores. This is where you will find the retail giants such as Homebase and Halfords, and large sports, carpet, and home accessory retailers. It could never be described as attractive but, as a functional shopping centre, it fulfils its role well. When you purchase large or heavy items you need you car close at hand, and the ample parking and loading spaces at Ladymead make the transfer of your purchases from the trolley to your car boot a doddle. In addition to the shopping facilities, fast food is available at a large Burger King, again with ample parking. For visitors without cars, the Park is served by several local bus routes, the numbers and times of which can be found on the Ladymead Retail Park website. The Retail Park is open Monday to Friday 9.30am to 8.00pm, closing earlier at 6.00pm on Saturdays, and opening from 11.00am to 5.00pm on Sundays. 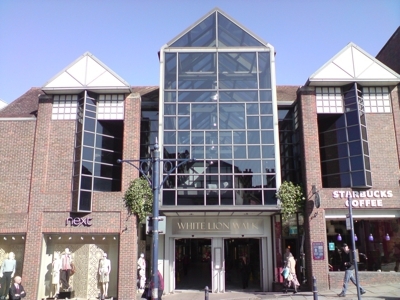 The casual visitor to Guildford could be forgiven for missing White Lion Walk, as the exterior resembles the entrance to a single shop or a London Underground station. However, the unimposing entrances, one in North Street and one in the High Street, lead to a lengthy shopping arcade that spans the gap between Guildford’s two main shopping streets. The entrances are deceptive as the shopping centre is actually quite spacious, with shops on two floors, toilets, baby changing facilities and opportunities to buy snacks and drinks. Starbucks and Next flank the High Street entrance to the centre, whilst the North Road entrance plays host to Robert Dyas and H Samuel the jewellers. Between these guardians is a mix of retail outlets covering shoes, children’s wear, jewellery, home accessories and even cookies. White Lion Walk is open Monday to Friday 9.00 to 5.30pm, until 6pm on Saturdays and from 11.00am to 5.00pm on Sundays and Bank Holidays. The Square is a delightful location for enjoying a coffee or meal, especially in inclement weather, with the huge conservatory style glass roof letting in abundant light whilst keeping out the wind, rain and chilly outdoor air. The Square can be accessed from the High Street, Tunsgate or Castle Street, and is open Monday to Saturday 8am to 6pm, and on Sundays from 10am to 5pm.